Last Friday, US Energy Secretary Rick Perry asked the Federal Energy Regulatory Commission (FERC) to intervene in wholesale markets to help keep coal and nuclear power plants online. The argument laid out in this Notice of Proposed Rulemaking (NOPR), is that these sources of baseload power generation, which have been under pressure from weak load growth, cheap natural gas and expanding renewables, have unique value to grid reliability because they can store significant quantities of fuel onsite. We dug through DOE’s own reliability data to stress-test Secretary Perry’s concern about fuel supply security warrants aggressive FERC action. Of all the major power disruptions, nation-wide over the past five years, only 0.00007% were due to fuel supply problems. The vast majority were the result of severe weather knocking down power lines, like in Puerto Rico where Hurricane Maria caused more customer-hours of electricity delivery to be lost over the past 12 days than in last year in the rest of the country combined. By publishing a NOPR in the Federal Register, Sec. Perry is taking advantage of a section of the Department of Energy Organization Act that allows DOE to propose rules for FERC consideration, and set a timetable in which they must do so. Sec. Perry has given FERC 60 days to address what he sees as the electricity reliability emergency created by the retirement of “fuel-secure generation” – namely coal and nuclear power plants that can store large quantities of fuel on-site. There have indeed been a large number of coal and nuclear units retired in recent years because these plants couldn’t compete, their margins squeezed by weak load growth, a shale-driven reduction in gas prices and rapid declines in renewable energy costs. Natural gas plants can’t store much fuel onsite and rely on a consistent stream of pipeline delivery. Absent large-scale battery or other storage, generation from wind and solar is limited to times of the day when the wind is blowing and sun is shining. Has the growth in these generation sources in recent years and simultaneous retirement of coal and nuclear plants created the reliability crisis Sec. Perry warns of? Is it urgent enough that FERC needs to intervene in wholesale markets in the next 60 days? Fortunately, the career staff that work for Sec. Perry collect data that can help us answer this question empirically. Whenever a utility experiences a major disturbance in electricity delivery to customers, they are required by law to fill out form OE-417, and submit it to the Department of Energy. On that form, the utility is required to list the cause of the disturbance, its duration, and the number of customers affected. These data are then published in the Energy Information Administration’s Electric Power Monthly. We tabulated all the OE-417 reports since the beginning of 2012 to see how big of a reliability threat “fuel supply emergencies” have been. This is a period in which 32% of the country’s coal-fired power generating units and 6% of its nuclear generating units were retired. The answer is, not much of a problem at all. Between 2012 and 2016, there were roughly 3.4 billion customer-hours impacted by major electricity disruptions. Of that, 2,382 hours, or 0.00007% of the total, was due to fuel supply problems (Figure 1). Interestingly, 2,333 of those customer hours were due to one event in Northern Minnesota in 2014. And it involved a coal-fired power plant. While the NOPR focuses primarily on the alleged resilience benefits of onsite fuel supply, it also highlights the risk of inadequate generation resources during periods of peak demand as a result of recent coal and nuclear retirements. Here as well the OE-417 data is illustrative. While “generation inadequacy” resulted in slightly more lost customer hours than fuel supply problems, it still accounted for less than one hundredth of one percent of the customer-hours impacted by electricity disturbances nation-wide between 2012 and 2016. The fact that neither fuel supply or generation adequacy have posed any real threat to electricity deliver doesn’t mean there aren’t reliability issues worthy of policy attention. 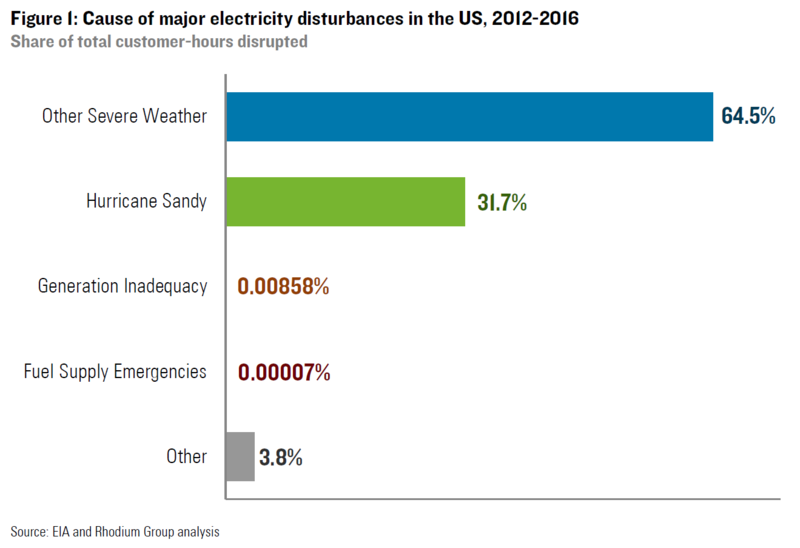 Severe weather still results in hundreds of millions of customer-hours disrupted each year, 96% of the US total between 2012 and 2016 (Figure 1). This has nothing to do with fuel supply security or generation adequacy. It’s about the vulnerability of transmission and distribution networks. While the utility industry has made some progress in recent years in hardening this infrastructure, there is much more that can be done. A wide array of operational and technological options exists to improve the resilience of the electric grid, decrease the frequency and duration of disruptions and get power back on quickly after an event. Some actions are as simple as keeping trees trimmed and away from power lines or using smart meters to alert grid operators to outages instead of waiting for customers to call in a problem. Distributed battery storage, microgrids and automated grid management systems can help to limit the damage by delivering power to some customers even when a section of the grid is cutoff from rest of the system. Many of these improvements fall under the jurisdiction of state public utility commissions but could benefit greatly from federal grant programs administered by DOE. Meanwhile, FERC already has a regulatory docket open that if finalized would require wholesale markets to allow storage and other distributed energy technologies to participate in providing energy and reliability services. Unfortunately, Sec. Perry’s NOPR needlessly distracts attention and resources from these other more impactful efforts. Of course, there is no better illustration of the reliability risks posed by extreme weather than the crisis in Puerto Rico. While Sec. Perry was releasing his NOPR last Friday, more than 3 million people in Puerto Rico were entering their 9th day without power. The average 123 mile per hour winds Hurricane Maria blanketed the island with for a period of 12 hours knocked down more than 80% of Puerto Rico’s power lines, plunging 95% electricity customers into darkness. Estimates for the time it will take to get the power system restored range from 2 months to 10 months. In either event, this is set to become the biggest electricity supply disruption in US history. For context, since the storm hit on September 20, there have been more than 450 million customer-hours of lost service. That’s 84% more than the nation-wide total during all of 2016. 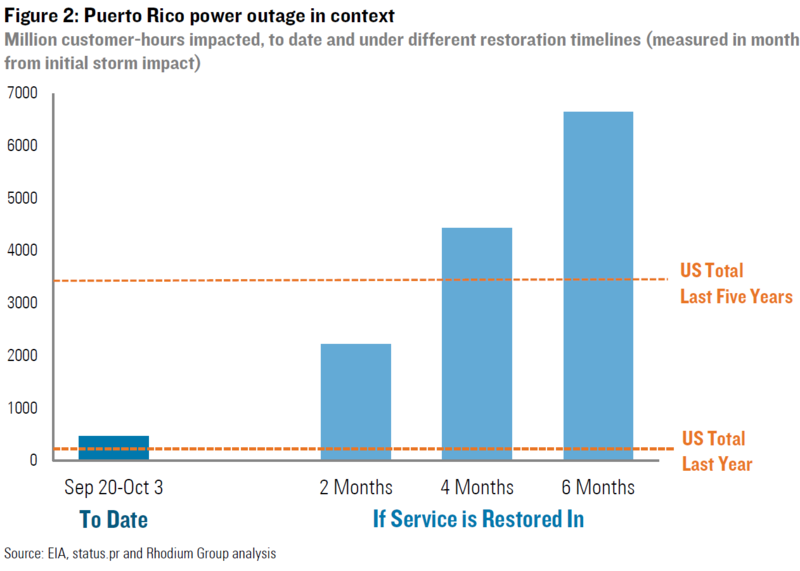 If the outage does take four months or more to address, as some predict, more US customer-hours will have been impacted by Hurricane Maria than all other events across the country combined for the past three years. Rebuilding the Puerto Rican grid as quickly as possible is essential to avoid a humanitarian disaster. But it is also the single most effective thing the US government could to impact national electricity reliability stats. Editor’s Note: The original version of this note included two errors. While Figure 1 correctly listed the share of electricity supply disruptions due to fuel supply emergencies as 0.00007%, the number used in the text was 0.0007%. The latter has since been corrected to match Figure 1. The original version also listed the number of customer-hours disrupted by fuel supply emergencies between 2012 and 2016 as 2,815. The correct number is 2,382.